Give your cheeks a rosy tint of NATURALBLEND BOTANICAL BLUSHER ICED MAUVE, which comes with an alluring shade of ICED MAUVE and is enriched with Aloe Vera and Grape seed extracts that combats acne and help in skin repair and restoration and is also a great anti-oxidant that maintains skin cell health in addition to skin's elasticity. It also has It soothing & conditioning properties that give a natural pink flush. 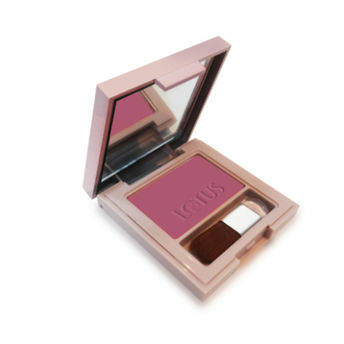 This blusher is satin smooth and smudge-resistant with an easy to blend formula. It protects your skin from sun damage. It has Soft Shimmers with lighting effects that subtly defines face and enhances complexion. It gives you an Even toned finish with radiant look. Does not streak or fade with time. It has a smooth brush application. Additional Information: Lotus offers an exclusive range of skin care, hair care and beauty products that contain a combination of different herbal extracts that give you fine results contributing towards a healthier looking skin. NATURALBLEND BOTANICAL BLUSHER ICED MAUVE gives you an enticingly natural blush. Explore the entire range of Blush available on Nykaa. Shop more Lotus Herbals products here.You can browse through the complete world of Lotus Herbals Blush .